Joan of Arc VS. Hulk Hogan. Round 1. Fight! A fighting game released in 1992 featuring eight characters, including Hanzo, Janne and Rasputin, modeled on historical figures from throughout the ages. 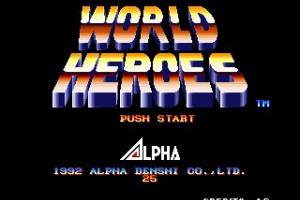 Released when the avalanche of Street Fighter 2 clones hit arcades in the early ‘90s, World Heroes was a minor success that gained a cult following thanks to a combination of impressive graphics, crazy characters and half-decent gameplay. Like..
A fighting game released in 1992 featuring eight characters, including Hanzo, Janne and Rasputin, modeled on historical figures from throughout the ages. 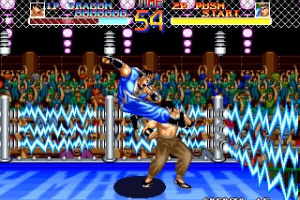 The fighters compete against each other to become the world's toughest combatant, with players using a setup consisting of only three buttons (one each for punching, kicking and throwing). Adding to this unique system is the fact that the strength of your offensive blow depends on how long the button is pressed and held. 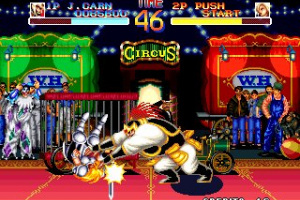 Along with regular match styles, Death Match mode is also available and features mines, electrified ropes and other dangerous objects in the battle arena that can change conditions during the fight or damage players. Enjoy the wide range of combat forms as you take on history's best! no way?!?!? 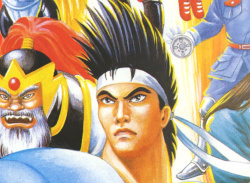 neo geo games? well, that's kewl. I wonder if we can get a few of the better atari jaguar games, too? I wouldn't count on it, michinuri. Chances are we'll have to wait for ages for neo geo games... even if they come out here at all. 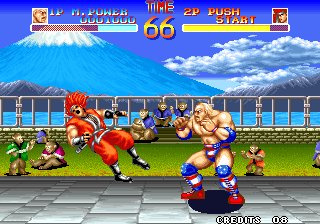 If you put this and art of fighting together SNK could have made sf2. That is funny, there is only one shadow that is shared by the characters. 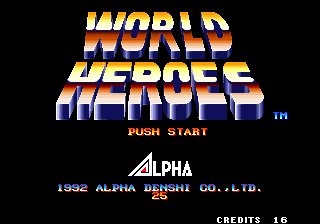 World Heroes doesn't look too thrilling as Street Fighter II Hyper Fighting has already come out. immediate download!not great...4 stars.looks cool but not original.fatfury is not original but is a classic. I thought Hulk Hogan would sue this game for the character Muscle Power? Otherwise the death matches were cool. I plunked many a coin into this game years ago. Glad to see it on the VC. 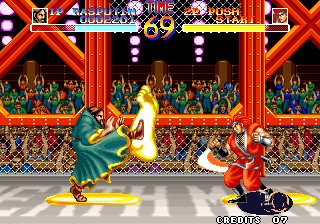 Anyway, if you are into fighting games I'd say go for it. If not, then just give it a look. I'd like to say hi to Itchy and Mitchy! I think they redesigned Muscle Power for the sequels to look less like Hulk Hogan. I think. 60HZ or no frills 50HZ? This game has some nice perks. The music is cool and so are the characters. Some of which are based on real people from history, but that should be obvious. 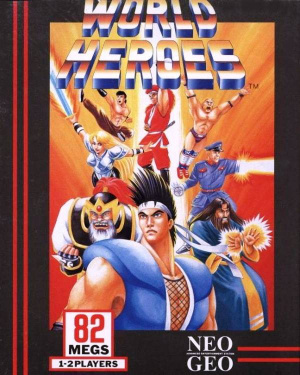 I'm surprised no other fighting games tried to copy the death match mode from this game, because it's awesome and it only gets better in World Heroes 2. 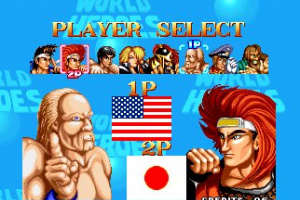 As of now, it's actually the closest Neo Geo game to SFII available in the states, but even when Fatal Fury 2 and it's successors and KoF launch, don't miss out on World Heroes. You can buy it after the others, but make sure you buy it at some point. 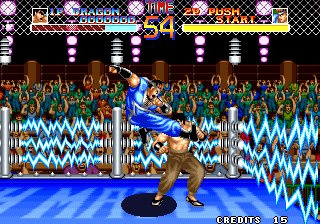 This game is far from horrible, but as an obvious SF2 clone, it's lacking much of what made SF2 so great. The gameplay is quite simplistic, and animations are lacking a few frames and seem a bit quick. The character designs are fun though, and I like the special moves graphics being a bit more over the top than SF2. The best thing I could say about this average game is that there's enough button mashing to it than even a noob can win a few rounds playing this one, making it fun to play against others while putting down some pints. If this were a bag of chips (crisps), then SF2 would be an order of fries (chips). They are both good, but one is just better. This game's so strangely inconsistent with its graphics. The character artwork on the character select screen is terrible, while the characters themselves during actual play look almost decent. But the backgrounds and levels look spectacular, and the ending screens are marvelous.